WHAT WE FILIPINOS SHOULD KNOW: (Note: Bold, underlined words are HTML links. Click on them to open the linked posting/article. Forwarding the postings to relatives and friends, especially in the homeland, is greatly appreciated). Some church people and laymen always talk about the lack of morality, more appropriately social morality/responsibility as it applies to our perennial, national political-economic crises.For 480 years and counting, most of us Filipinos have been taught about or inherited the (Roman) Catholic Christian, or any Christian variety religion. For some reason, there obviously is something wrong in the inherited or method of teaching since we supposed Filipino Christians have become superficial, truly nominal or "split-level" Christians (Fr. Jaime Bulatao, SJ seems to have coined it during the 1960s). as clergy and laity are more concerned about following the Catholic Church as an institution, its rules and teachings; rather than living or emulating the supposed ideas and life of Jesus (which somehow gave birth to Christianity as a cult/sect, then grow into an institutionalized religion. I wonder if Jesus would have wanted to be the object of adoration rather than the object of emulation? This fact seems to historically characterize great ideas or movements that became dominant or institutionalized. The formerly persecuted Christian minority became the dominant/official religion of the Roman Empire under Emperor Constantine (272-336 AD). It is long overdue that all self-proclaimed Christians: be they Catholic Christians, mainline Protestants, Evangelicals, Pentecostals, etc. among us Filipinos, of all variety or spins of Christianity, learn, think and understand authentic (true) Christianity. And to realize that it is not all about memorizing one's Bible (which has many versions by various Christian sects) to the point of elevating a book to godliness or adoration; to the point of withdrawing from social justice and mainly concentrating on pure concern for "personal salvation" by "Praising the Lord." Is that Lord (Jesus Christ/God) so selfishly insecure to want central attention at the expense of the perennially suffering poor; or we so-called Christians simply believe that these unfortunates deserve their status in life, in what they get or not have; seemingly like one local Chinese angrily wrote back to me: "they all are just mga palamunin!" Authentic Christianity is about consistency and honesty. It is consistency to the teachings of Jesus Christ, to one of two that I think is most relevant and important in society: Christian love = love of neighbor (not the "sexual healing" kind, though admittedly very pleasurable). It is consistency to his teachings on good deeds towards one's neighbor, in our homeland, those mired in poverty, thus illiterate, thus exploited, thus looked down on. This essential teaching has not been internalized, not made integral into the character of the self-proclaimed Catholic Christians, of many Filipino Christians. 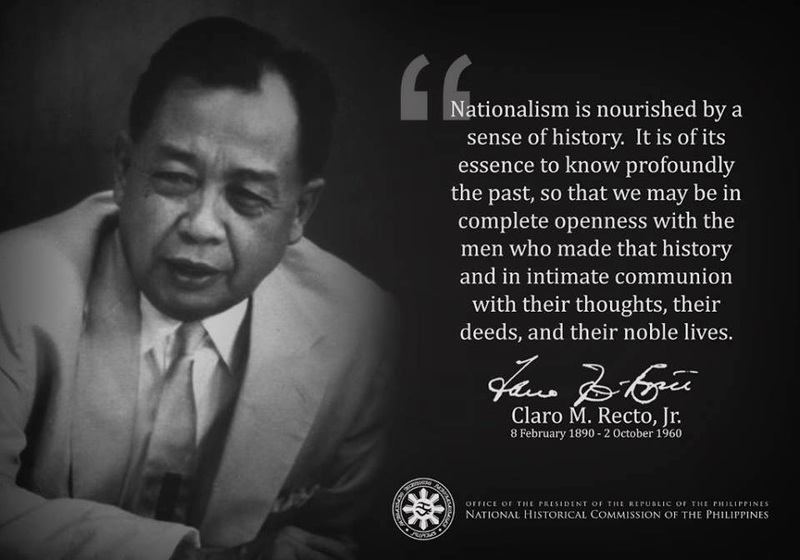 Therefore as applied to our homeland, and more specifically to those native Filipino Catholics who are, economically and politically, in power and thus can do something about the predicament of the majority, it has not been applied; at worst, it has knowingly been ignored or paid lip-service, call it then hypocrisy. It is about Christian love, not the lovey-dovey kind, but honest concern, decisions and actions FOR the impoverished majority. All other stuff about religion which we learned in the catholic schools, we can throw out the window. Below an article that can help us understand ourselves; about our Filipino beliefs system, values, attitudes and behaviors -much of which characterize out Filipino culture, which we are all familiar with; but not really analyzed and understood, especially as to their inconsistent relations to the self-proclaimed Christianity. Fr. Vitaliano Gorospe, SJ clarified this inconsistency in said article almost two generations ago (1966). Another way of looking at the problem of morality in the Philippines is to consider the actual and prevailing norms of right and wrong among Filipinos. It is quite obvious that there is a conflict between what they say as Christians and what they do as Filipinos; between their actual Filipino behavior and their ideal Christian behavior; in short, between what is and what ought to be. One norm of morality in the Philippines is based on "group-centeredness" or "group-thinking." One's in-group determines for the individual what is right or wrong. The individual who has not yet attained moral independence and maturity will ask: " What will my family, or my relatives and friends, or my barkada think or say?" "What will others say" usually determines Filipino moral behavior; it is "conscience from the outside." For instance, parents tell their daughter who is being courted: "Iha, please entertain your boyfriend at home. Do not go outside. What will the neighbors say? Nakakahiya naman." Shame or hiya makes the parents and the girl conform to the social expectations of the neighbors lest they become the object of chismis or gossip. Here again there is a conflict between the individual and social morality, between internal and external morality. The norm of morality should be internalized so that the mature individual should form his own moral "conscience from the inside." Another norm of morality in the Philippines is characterized by the "Don't be caught" attitude based on shame or fear of the authority figure. The authority figure may be a parent, teacher, priest or policeman. As one law student puts it:" What's wrong with cheating in the bar examinations as long as you do not get caught?" During the war, it is told that a prison official of Muntinglupa addressed his new prisoners thus: "Here there are no Ten Commandments. You can obey or break the rules as you please. But God help you if you get caught." This norm of moral behavior also gives rise to a conflict in the individual between the "don'ts" of the authority figure and "what every else does" in the latter's absence. As long as a policemen is on duty, Filipino drivers will obey traffic rules but if there is no policeman, then everyone else tries make puslit or get ahead of the others often causing a traffic jam. We find in the Filipino whose norm of behavior is purely external, a split between the ideal Christian norm of morality and the actual Filipino norm of morality. He will put on the externals of Christian moral behavior in front of the authority figure while at the same time follow in "real life" an inconsistent moral behavior when the latter is "at a distance." The problem for the Filipino individual is to be "aware" that the two inconsistent norms of morality are allowed to coexist in his personality and life and that he must overcome this split if he is to become a mature Christian Filipino. What can be done about the problem of morality in the Philippines? In this respect, the question of attitudes, whether on the part of the individual or on that of society as a whole, is quite relevant. The solution to a problem depends to a great extent on one's awareness of the problem and his attitude towards it. Let us consider the various attitudes that the Filipino indiidual or Philippine society can take towards the problem of morality and religion.The worst possible attitude is not to be aware of the problem at all. The person who is not aware that he has a cancer or heart trouble will not see the doctor. Another wrong attitude is complacency when one is aware but is not concerned. The individual who feels secure and comfortable with the status quo sees no need for change. Some individuals see the problem but it is too frightening. Hence they are afraid to make a decision and initiate change because it is painful and difficult. This is the attitude of timidity. Others try to escape from their real problems. They skirt confrontation with the real issue in their lives and hence raise up pseudo problems as camouflage. Finally a very common attitude is rationalization. People who know they are doing wrong but do not want to change easily find excesses like "ako'y tao lamang" (I'm but human), "ganyan lamang ang buhay" (life is like hat), "bahala na" (come what may), or "eveybody is doing it." In this age of "passing the buck," another excuse for shrinking personal responsibility is the Filipinism, "I am not the one". All these attitudes of mind are wrong and without the proper attitude there can be no solution to the problem. Filipinos will make no progress toward a Christian solution until they realize that the problem is serious and urgent.